EarthKAM photograph 152231 was acquired on October 31, 2017, with a Nikon D2Xs digital camera using a 50 millimeter lens. The photo in this article has been enhanced to improve contrast. It is provided by the Sally Ride EarthKAM@Space Camp on the International Space Station. The caption is provided by the Earth Science and Remote Sensing Unit, NASA Johnson Space Center. EarthKAM (Earth Knowledge Acquired by Middle school students) is a NASA educational outreach program that enables students, teachers, and the public to learn about Earth from the unique perspective of space. During Sally Ride EarthKAM missions, middle school students around the world request images of specific locations on Earth. Caption by M. Justin Wilkinson, Texas State University, Jacobs Contract at NASA-JSC. Taken through a window on the International Space Station by the EarthKAM camera, this photograph shows the boundary between a light-toned dune field and dark hills in the very arid interior of Yemen. This remote region occupies the southern part of the vast Arabian desert, and lies inland from the southern end of the Red Sea (to the west). Only one settlement appears in this image—Deerat Al Hwelah—at the mouth of a valley. The dark, convoluted landscapes are exposures of ancient Precambrian rocks (more than 540 million years old). 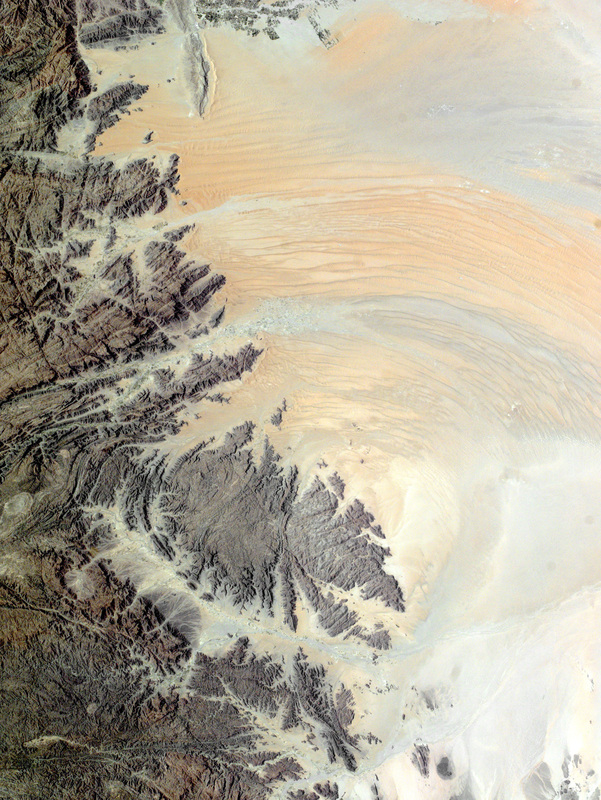 Several rivers—almost always dry in the Arabian Desert—lead out of the hills via the light-toned valleys. On the few occasions when they flow, the rivers transport sediment (eroded from the hills) into the low dune country. Here, dominant winds from the northeast blow the sediments back toward the hills in the form of long, linear dunes. 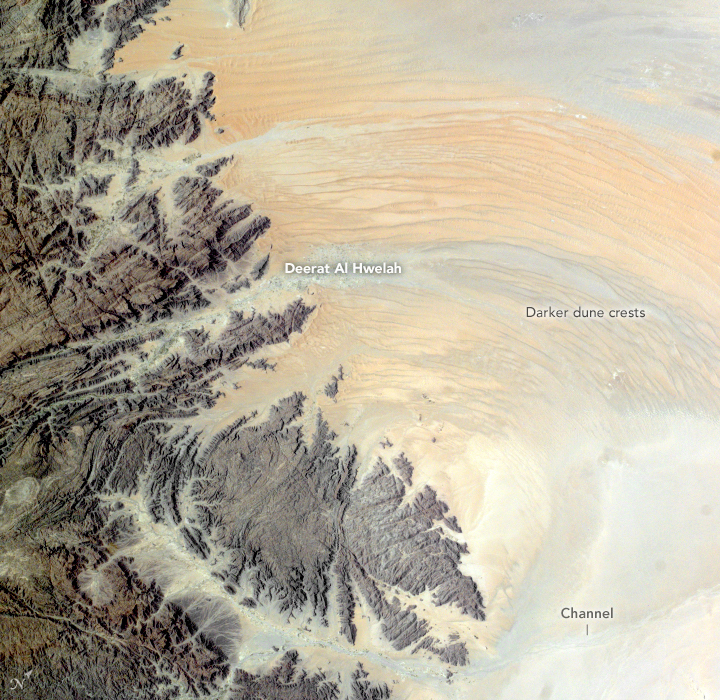 Southeasterly winds from the Gulf of Aden (out of the image, lower left) combine with the dominant winds to generate the broad curve of the dune alignments. The low country is light-toned because the hardest minerals carried from the hills are generally light-colored silicates (minerals rich in silicon). Darker-colored minerals found in the Precambrian rocks tend to weather and erode more easily to smaller particles, so they are more easily carried away by winds. However, some of the darker minerals appear to be accumulating along the crests of the dunes (image right). The river in the large valley at the bottom of the photo bifurcates into two channels. The larger course washes sediment slightly west, where winds blow some of it into dunes and ultimately back up the Deerat Valley. McKee, E.D. (editor) (1979) A Study of Global Sand Seas. U.S. Geological Survey Professional Paper 1052.